“Is this the bus to Brixton,” I asked the driver, getting the answer in the form of a huge, beaming smile and big thumbs up. “Great!” I replied, and made my way to a seat. I’d never got the bus to Brixton before. Barely knew where I was going in fact. All I knew was that I was cutting it tight for my train, and it was all the tube’s fault due to it being partly suspended. My navigation of Brixton wasn’t helped by the fact that the bus bypassed much of town centre, and it was only when another passenger asked if the stop we were stood at, was the best one for the shops that I avoided heading off to some other unknown destination. I sprinted out of the doors and landed on the pavement, wondering where on earth I was and where I could find a train. With seconds to spare I sprinted on to the platform, having done a rush in to Sainsburys on the way to pick up a sandwich. Before I knew it I was heading to Otford on a battered looking train which seemed to have had a number of seats added to it which had been cannibalised from an old bus. I couldn’t even go to the toilet as the handle had fallen off the door. Ah, luxury travel, I thought, as I slumped on the uncomfortable looking bus seat and headed off to Kent. I almost missed Otford station, resulting in yet another frantic rush to disembark. I’d spent most of the journey playing with my new phone which, infuriatingly, seemed to be having trouble sending text messages for reasons I couldn’t for the life of me understand. Which is why I spent the first half hour of so of my walk out of the town staring at a screen, wanting to throw the confounded thing on the floor and grind it to dust with my hiking boots. All of which is why I couldn’t tell you much about the steep climb up Otford Mount other than that there was a viewpoint near the top with a handy bench where I sat, staring at a phone screen in puzzlement before giving up and throwing it in my rucksack. Given it was the middle of October, autumn seemed to be rather absent and a bright sun sat high in a clear blue sky. The light was so bright it was incredibly difficult to see. 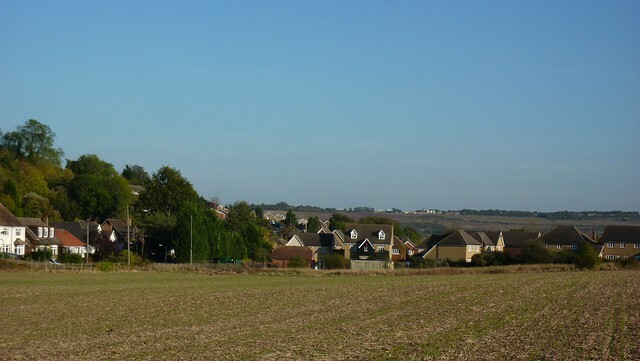 Off in the distance the cries and shouts of children playing in some unseen school filled the air> I walked through a series of fields and tree lined tracks towards another viewpoint overlooking the village of Kemsing, where a wooden cross stood, held upright by a brick base. There was no explanation as to its presence. If it was someone’s hope that it might convert a few unbelievers, well they would have been disappointed by its failure to do so with me. The first big destination for the day was Wrotham, a village now penned in almost inevitably by a motorway – in this case, the M20 – but historically it had gained its fame for its position on the Pilgrim’s Way. I followed a series of paths to it; the North Downs Way yet again spending its time heading down a tree-lined rutted track. When it wasn’t on a track, which wasn’t often, the Way was going along narrow fenced in paths along the side of fields where horses munched happily away on the grass, blissfully ignoring my presence. Given it’s location right next to a major motorway, Wrotham was surprisingly quiet with just a gentle hum of road noise giving the game away that there was a major road route running nearby. It was lunch time when I got there and I sat on a bench on the edge of a playground whilst yet more children shrieked and shouted at a nearby school whilst the autumnal sun blazed away high overhead. Crossing over the motorway I joined another track named the Pilgrim’s Way and headed off down in to the trees once more. Oh the trees, how I loved thee. Or was it loathed? I couldn’t quite be sure. Who knew that the South East of England had so many? Certainly not I. 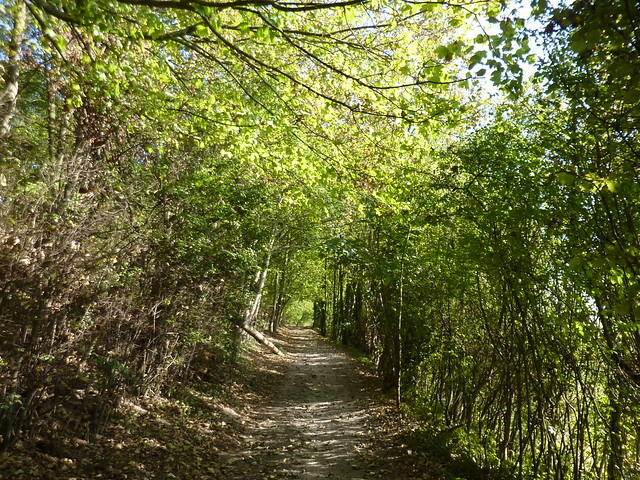 The North Downs Way’s obsession with tree lined tracks was getting a trifle infuriating. Here was a beautiful day, yet for most of it I was stuck in shaded undergrowth. And there are, if we’re totally honest, only so many times you can look at trees and admire their beauty. Which is a shame as a look at the map revealed I’d be barely out of them for the rest of the day. Trosley Country Park, just outside the village of Vigo, at least gave something slightly different to look at as the North Downs Way went past a plethora of woodland exercise equipment. 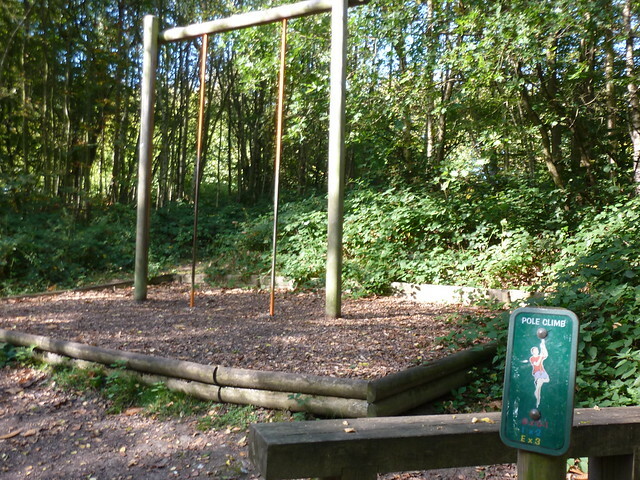 Any North Downs Way walker that wanted to do a quick pole climb was well served. Not that anyone seemed to be using it; the park was more popular that afternoon with people who wanted to walk their dogs than those wanting to spend an hour or two on an outdoor cross-trainer. I stood looking at the pole climb for a minute, wondering whether I’d be able to use it in my hiking boots. And then whether I’d actually have the upper body strength to do it even if I did have appropriate footwear. As a child at school I’d always struggled with the rope climb, which just seemed a completely pointless activity given that it basically consisted of climbing up a rope and then being stuck there wondering what to do next. Pointless it may have been but as a seven year old in the primary school gym, how I longed to get close to having that conundrum of what to do next. My arm muscles would barely pull me up an inch off the ground. I usually got higher by jumping up and down. Even if I had made it to the top of the rope, what would this have achieved anyway? How many people have reflected on their childhood and thought “Thank goodness they had those ropes. They made a huge difference on my life. It was great preparation for life”? The school hall rope climb was as about as useful as being forced to lift medicine balls at high school; an activity which I can only conclude was introduced by sadistic PE teachers. Still, I wondered whether any other National Trail’s would be enhanced by outdoor gym equipment. Imagine walking on the Pennine Way and finding a pole climb in the middle of some bog. It would be the ultimate challenge, as well as being a handy way to haul yourself out when you inevitably got stuck. I barely noticed when I left the park’s grounds. Nothing seemed to change. It was just that one minute I was in the park, the next I was on an identical looking path outside it. The only real difference is that suddenly all the dog walkers had disappeared. It was like there was some invisible force that prevented people from leaving the park grounds. Maybe there was. Maybe I only escaped thanks to a hidden microchip in my copy of the official North Downs Way trail guide. If I had lost the book or something I could still be wandering round the place, wondering what I’d done with my dog. It wasn’t just me who was lost in the moment of confusion. As I emerged on a lane covered with last years leaves I looked across and straight in to the eyes of a grouse which stood looking transfixed at me for a few seconds before finally deciding that a loud noisy escape was better than a staring contest. Eventually I did notice a difference as the North Downs Way followed the edge of a large field for a mile or so, before reverting to type once more and heading along a tree lined track; the only chance of a view being the occasional gaps between the branches. But after a while I realised it wasn’t just views I was missing. As I climbed another short but steep hill I realised that after many miles of it being in the background, I’d finally escaped the noise of roads and motorways. For the first time in ages it felt like I wasn’t in the crowded South East of England, but in some remote part of the country. 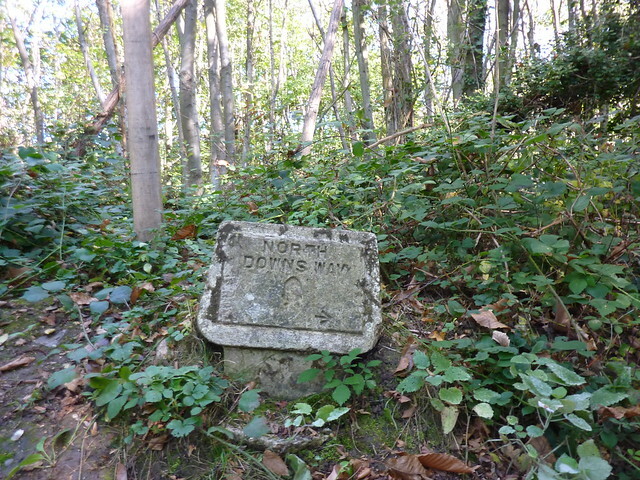 The North Downs Way had other ideas about tranquillity though as suddenly the route waymarks completely disappeared. “Is this the North Downs Way?” asked a woman, stood to the side of the path and looking rather confused. “Yes. Well at least I hope so!” was all I could reply, explaining that the last signpost I’d seen had pointed in the direction I was walking. Her partner had headed off down some side trail and as she shouted to him to come back, I passed by and left them to it. Moments later I took a wrong turn myself, finding that I was stood in the middle of a patch of trees with no path and no idea how I’d got there. The trees were finally escaped near a place named Upper Bush. It was near Lower Bush and, notably, only a mile or so from Cuxton where my days walking would end. Once more I was surrounded by people as the locals flocked to the paths to enjoy the evening sun. A group of teenagers sat at the top of the hill, overlooking a ploughed up field, telling his friend how to admit something to his mum. Presumably he’d add on the wide puppy eyes as well, but his acting skills were such that any parent worth their salt would have known that “a month” actually meant “I’ve been doing it for five years but only just decided to tell you cos I’m afraid you found an empty fag packet in my coat pocket.” If I’d have been his dad I’d have given him a right earbashing for coming up with such an obvious, blatant lie, and I had to stifle a laugh whilst thinking about their complete naivety. 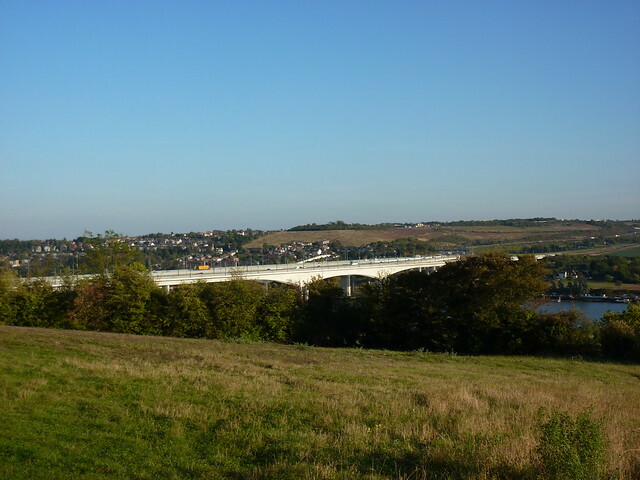 And then, from the top of the hill, the road noise suddenly reappeared as the River Medway came in to view, along with the bridges that carried the busy M2 over it. Despite the noise of lorries and cars speeding along, it seemed an almost arresting site to behold, and as I headed down the main road to Cuxton’s tiny railway station I tried to get as many views of it as possible. It was like a marker; a line in the sand. The river was a boundary in a way that nothing else was. Despite the fact that I’d gone way beyond the half way point, the river seemed to symbolise it in a rather curious way. I walked on, staring out as the cars and lorries thundered along. And then, as abruptly as the view had appeared, so it went again as the path ducked down in to the village. The bridge went out of sight, and crossing it would have to wait for another day. Now it was time to head home. London was waiting for me. Next time: the River Medway is crossed, Borstal is avoided and there aren’t any cows in a field, much to the relief of three teenage girls. Ah, my home section at last. What it lacks in views through trees though, it makes up for in terms of up and down. And if you walked all the way from Otford to Cuxton in one day then you’ll have done quite a lot of that. It’s where I walk locally to train for the hills. That stretch from Holly Hill through Horseholders Wood is easy to get lost in – there are a couple of waymarkers on trees that you can easily miss. I’m a local and I’ve found myself heading for Luddesdown at least once. Hope that track through the woods wasn’t too muddy – it’s usually pitted with enormous water-filled trenches and the rest of it is usually a carpet of slime. You should have made a slight detour to see Coldrum Long Barrow (near Trottiscliffe), well worth it. Sadly my guide book didn’t mention it and I didn’t spot it on the map! Maybe I need to do more research before doing my trips! Thank you so much for sharing this! I love your descriptions of everything. We just got to this section of the walk last weekend and it was gorgeous. There were bluebells in most of the wooded sections so I didn’t even mind being in the shade for most of the walk. I’ve been walking the North Downs Way this autumn/winter. Latest leg was at the start of December and slightly shorter than some of the others I’ve done, from Dunton Green to Wrotham (which takes in part of your walk). The cross on the hill over looking Kemsing was indeed interesting. Even more so for me as I was chased by two hungry old Gypsy horses here. A little further on a pint in the Rising Sun pub is an experience I will never forget! Rural England at it’s best. I walked the North Downs Way in 2016, to celebrate my 50th birthday, and read your whole blog before I started. Thank you so much! 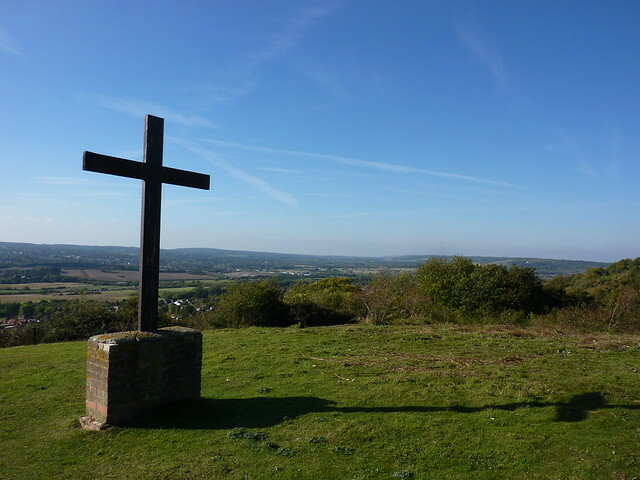 Having grown up in Otford I can tell you about the cross on the hill above Kemsing. It is, in fact, in the grounds of Otford Manor that is a Christian Conference Centre, previously known as Hildenborough Hall. I think the cross was donated by the Sisters of Mercy from Dortmund, Germany, and was a symbol of peace after the second world war. As a child, our youth group had a tented event up on the hill for a couple of weeks and the cross was symbolic in decisions that several young people made to become Christians. It sounds like you didn’t get the nicer parts of the Trosley trail. 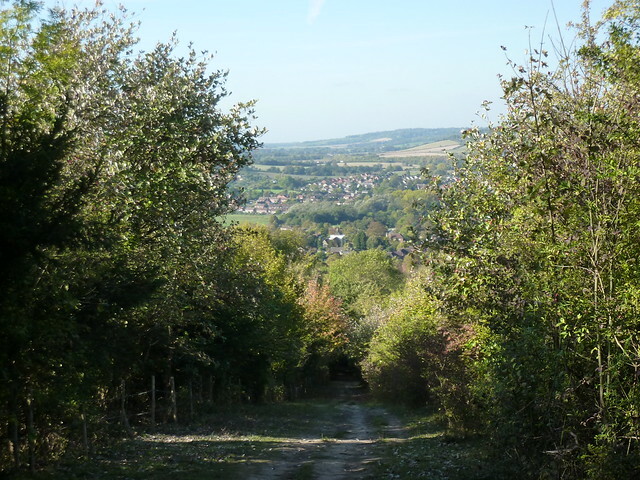 If you take the right – hand route through the park rather than the left, you can take a tiny detour to get beautiful views from the top of the escarpment looking out over Kent, down a chalky slope which is full of life. I echo the suggestion to see Coldrum Longbarrow – it’s an ancient burial mound with standing stones, and is very atmospheric. A grouse in Kent? Bit of off its usual range. First Published: 30 January 2013. Last Updated: 16 November 2014.